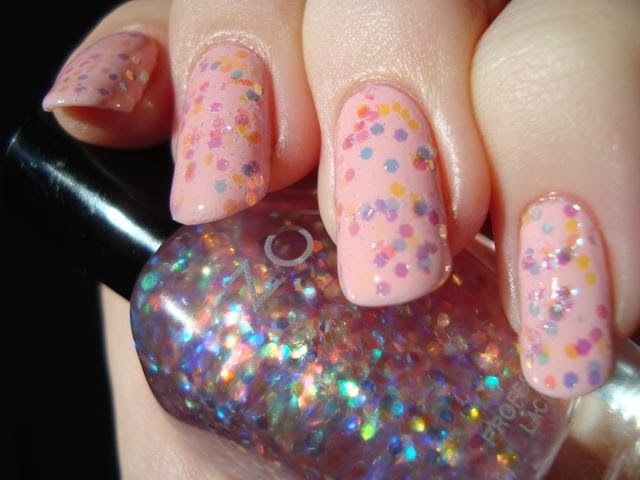 Monet has a pink-tinted base with large iridescent hexagonal glitter. Normally I'd go with a more 'straight out of the bottle' look for the first photo, but I like it this way and it's my post...so there. 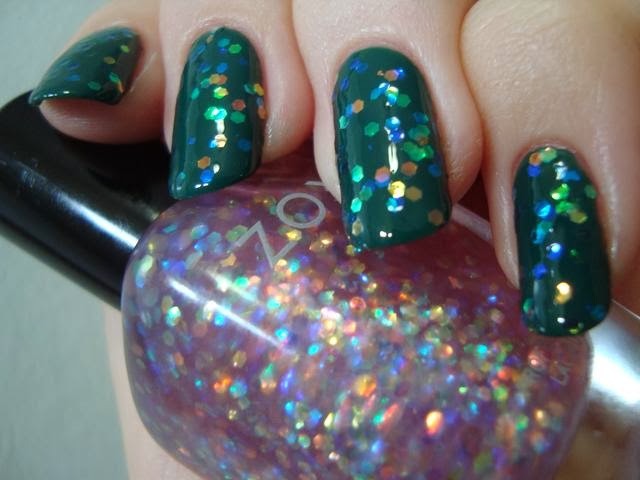 Monet was released with a collection full of springy pastels, but I think iridescent glitter looks best over a darker base. Ulta Green & Wear It (from their Professional line) is a little twist from standard black or the blue I'd typically choose, but I think it works. Mattifying gives the delicate, translucent glitter as much impact as it can ever have. So how is Monet? Well...as much as I want to love it, the formula of the base leaves a lot to be desired. I swatched it over Green & Wear It after thinning it, because it bubbled and fought me a bit when I put it over Dot. (More on that in a bit.) It takes the dabbing you'd expect from a larger glitter like this, but that's not the real problem. The base is thick, prone to bubble when dabbed, and even oddly stringy. Thinning it mostly nixed the bubbles, but it was still not great to deal with. On the plus side, it's not terribly "thirsty". I do two coats of NYC Grand Central Station over most of my swatches. In person that looked like enough here, but in photos....well...I could have done with a third. Still, that's not as bad as many other glitters, so that's a benefit of this otherwise frustrating base. Let's see it mattified one more time, because for the bit of hassle, there is a good dose of pretty here. 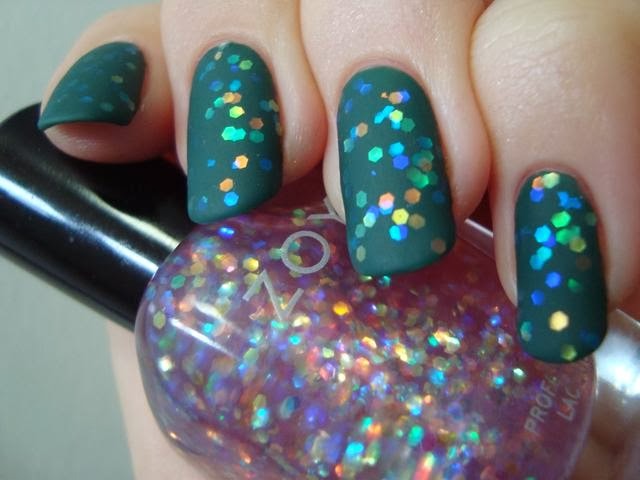 I especially love the way the glitter looks when two pieces overlap. When sunlight or other bright light hits it, it's a scattering of pastel confetti. When it's in shade though? In shade it's a whispered suggestion of color, with an occasional pop. At times you barely see it at all, but then it becomes a sort of soft glow. It's not bad this way, it's just not much to look at. I like it bolder. Again, I think it looks better mattified. The soft twinkling has more presence like this. It reminds me of out-of-focus water droplets on a camera lens. While I have a lot of iridescent glitters, Monet seems to be the only one that's all one size and one shape. Among my collection, it's closest to Sally Hansen Snow Globe, but the hexagonal glitter is larger and there's no microglitter. It's much farther off from China Glaze Make A Spectacle than I expected it to be. I knew it didn't have the microfleck, but Monet's glitter looks huuuuge in comparison to the hexes in MaS. It's got more blue too. Nicole by OPI Here Kim's The Sun is miles off. The color mix is the same, but the size difference is major. 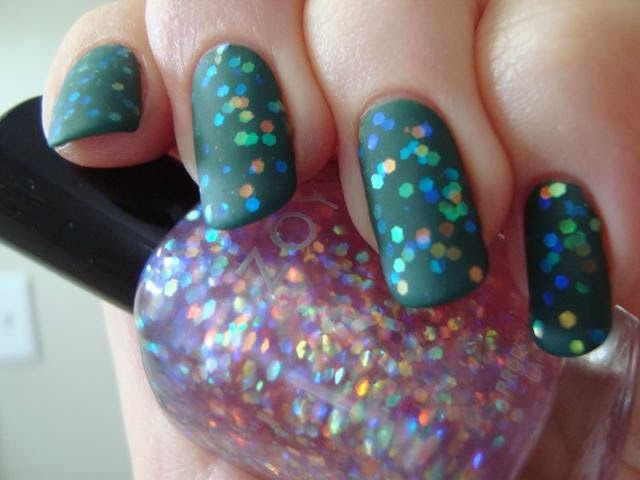 It's reminiscent of Revlon Heavenly too, but without the squares and with more green. It's along the lines of so many things without being a dupe. Bottom line: I can't call it a must have, since most companies make something sorta along the same lines. The formula's not great either, though the thickness of the base does mean it takes less top coat to smooth it out. If I had to give it a letter grade, I'd call it a C. It gets extra credit for not having a real dupe in my BIG collection. So this brings me to a question for you guys, if you're still with me after a long review... How willing are you to put up with fickle formulas? Do you grit your teeth and deal with it or do they get purged? I really love how this looks like bokeh when its matte. Send me a decant? ...despite the less-than-perfect formula? I know how you usually feel about that. Yeah. I wouldnt want a whole bottle. its not that special. but I'd like to play with it. Ugh so gorgeous. I have to have it. 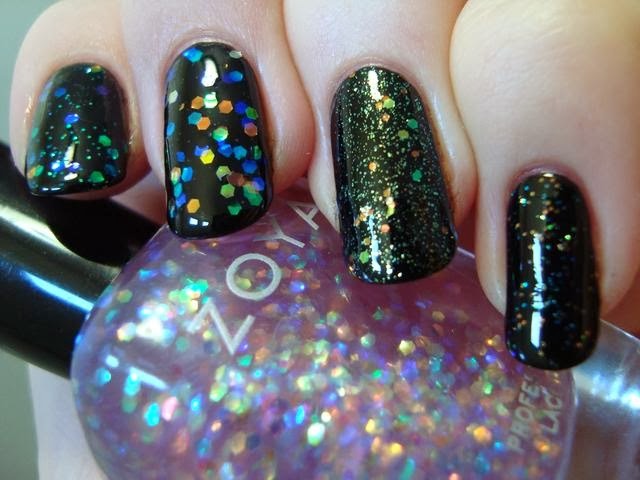 Have you tried layering it under a jelly polish like Zoya Paloma or Frida? 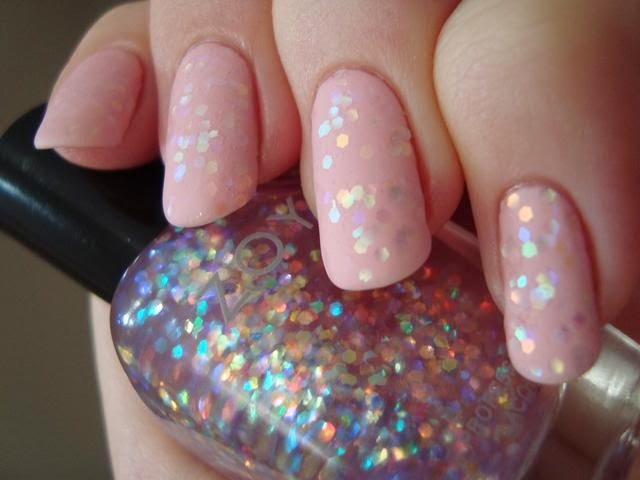 I think it would look really pretty to layer the polishes.